【SOFT, CONCISE, SIMPLE】:IMPORTANT NOTE:iPhone XS is not compatible. 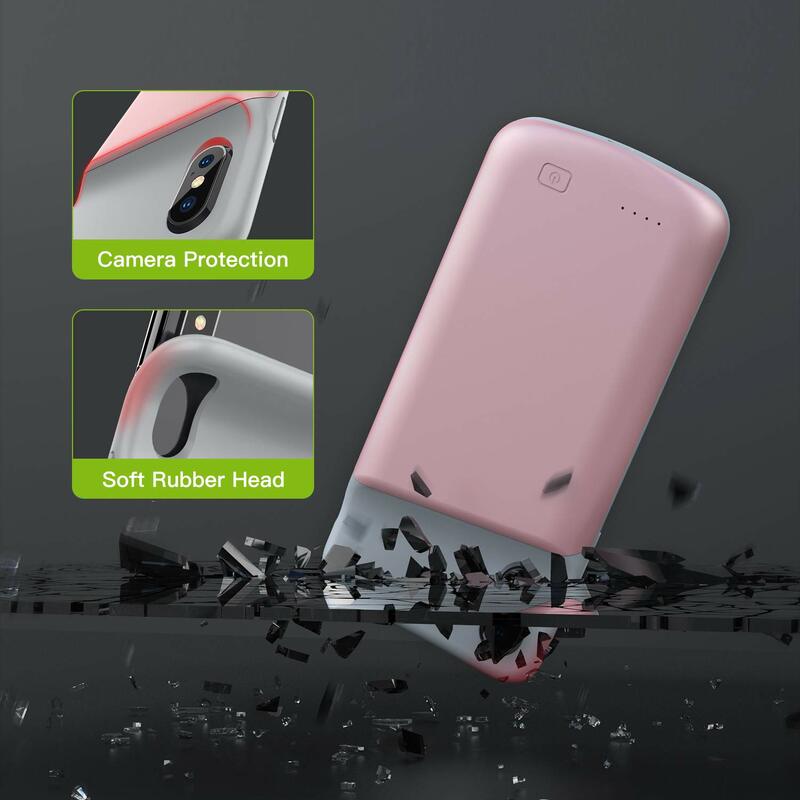 Featuring with elastic soft material, simply slide your phone into the charging case and installation is done. 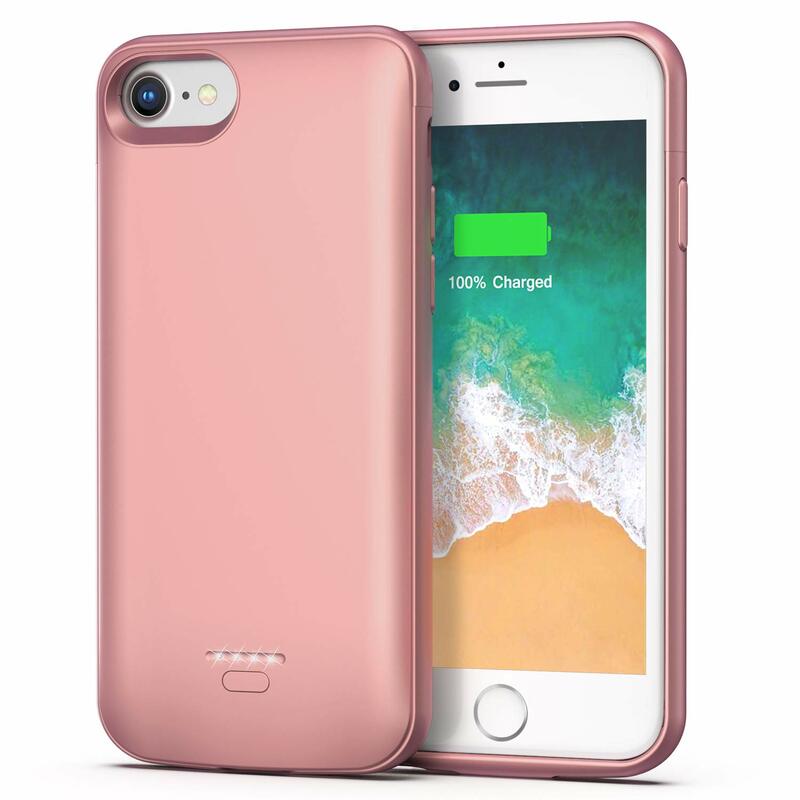 Make sure your phone connected well with the case.Press the power button for 3 seconds to start recharging your iPhone X / 10. 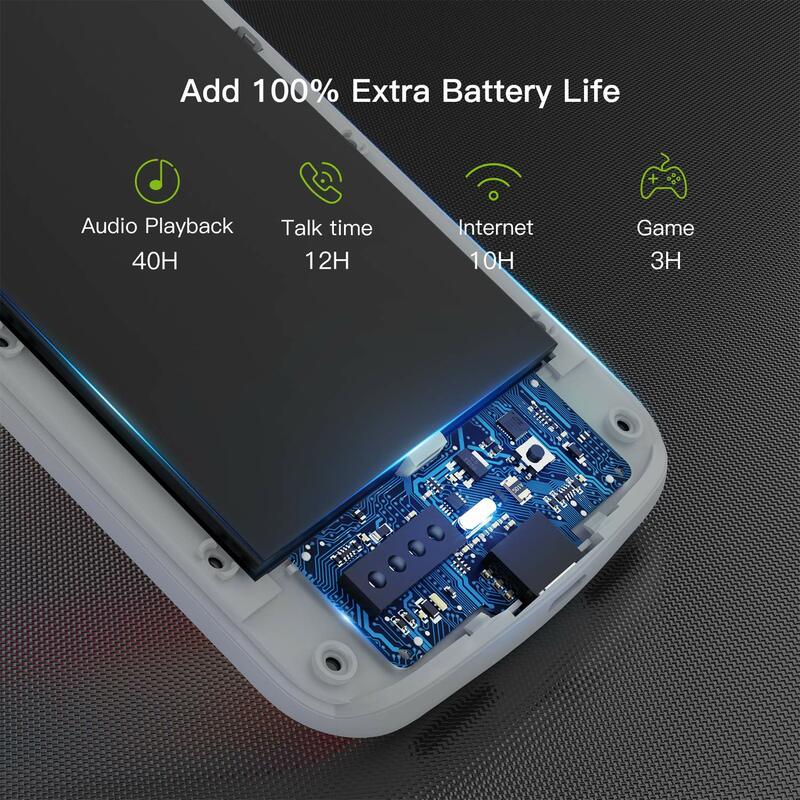 【MORE THAN 100% POWER】: Endurable 4000mAh battery can double your iPhone X / 10 daily lifespan, keep iPhone X / 10 powered for longer time. 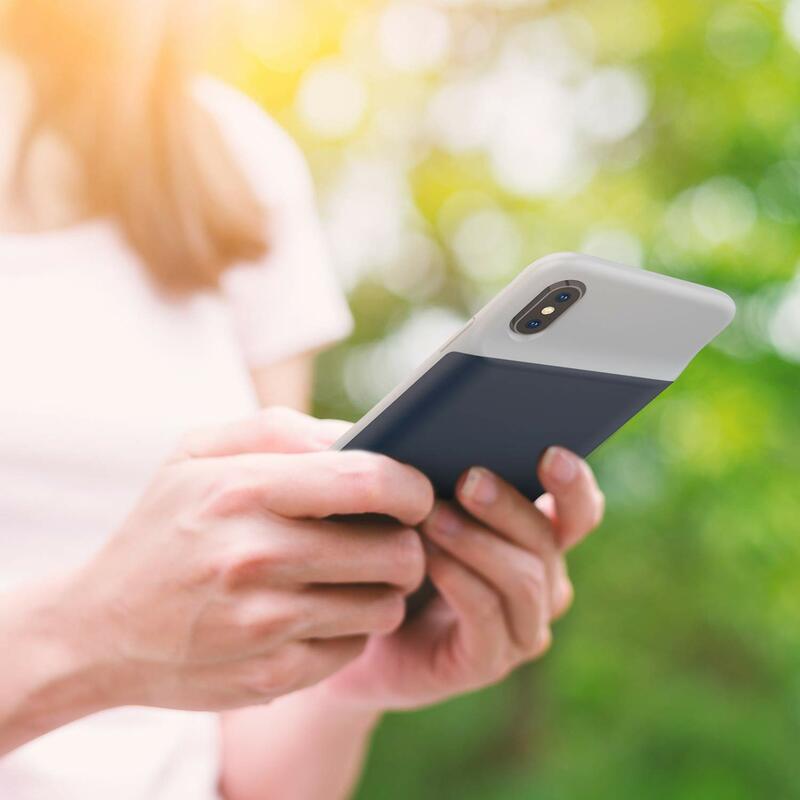 Smiphee knows it is important for you to stay online, now say goodbye to low battery anxiety and awkward moments. 【CHARGE, LISTEN, ENJOY】: Plug your original charging cable and (5V1A ONLY) adapter to the charger case, battery case and the phone will be charged simultaneously. 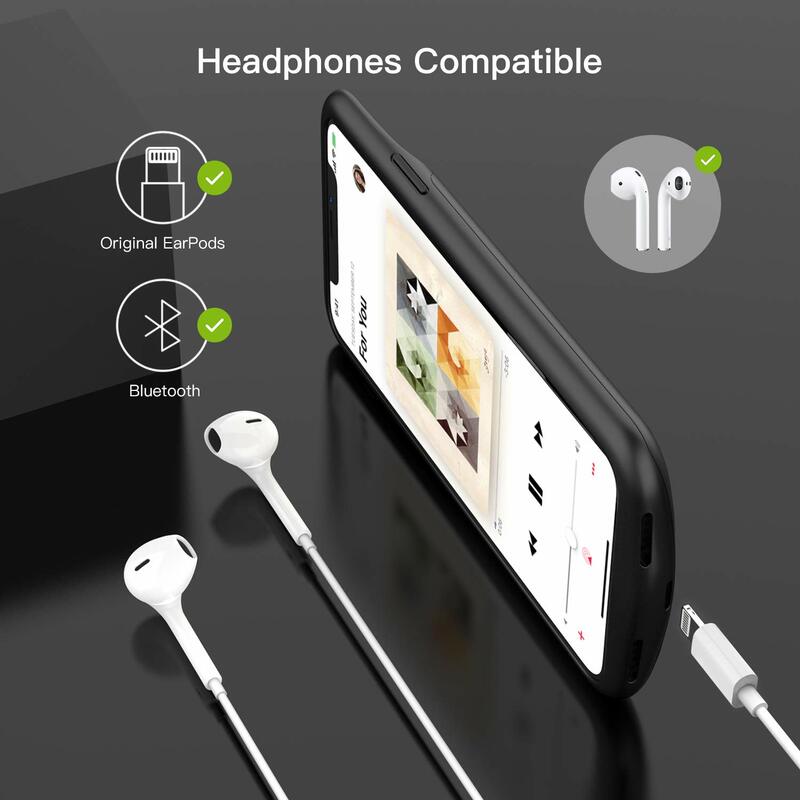 Support the headphones that came with your phone, no need to remove the battery case get full audio access, no need to remove the battery case get full audio access. 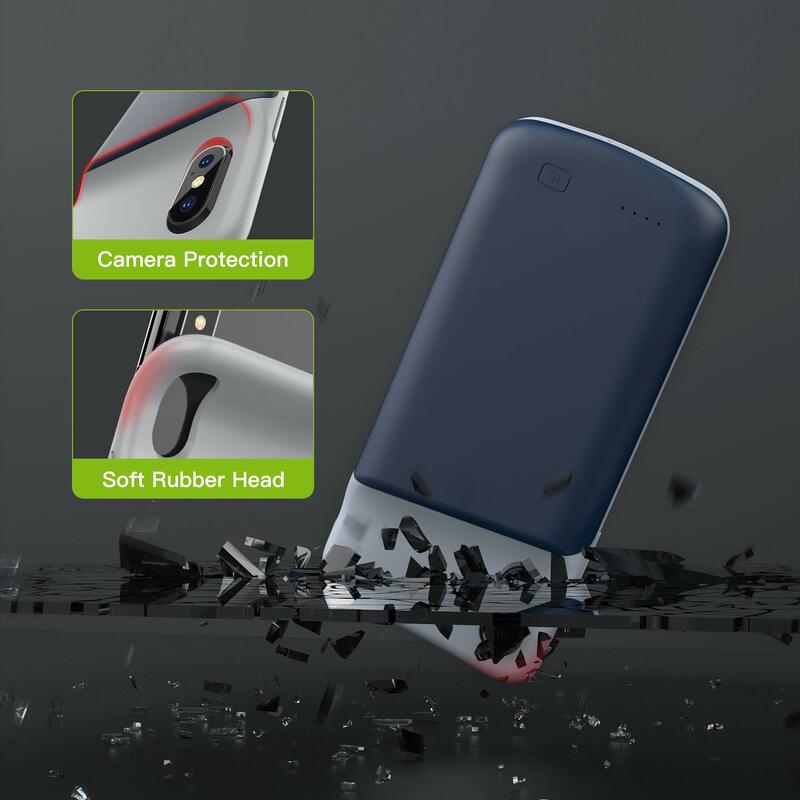 【UPGRADED PROTECTION】: Designed to provide heavy duty level protection, bumper and hard-shell backplate can protect iPhone X / 10 from scratches and falling. 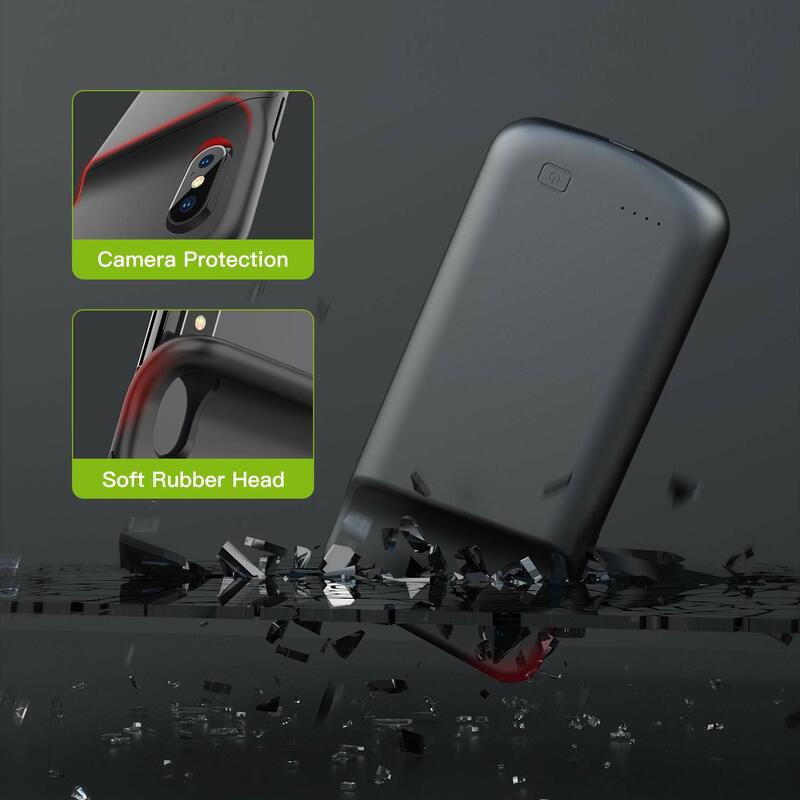 Front bumper raised added protection for your phone screen. 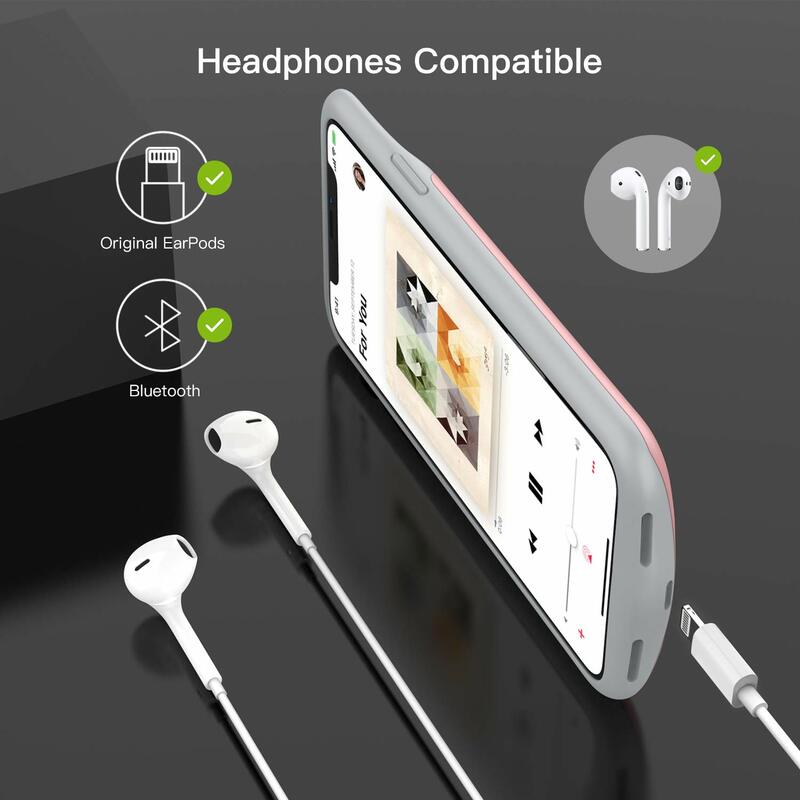 【100% REFUND GUARANTEE】: 12 months worry-free product guarantee from Smiphee, ensures long-lasting enjoyment of your purchase. Please be free to purchase by clicking the Yellow Add to Cart button. 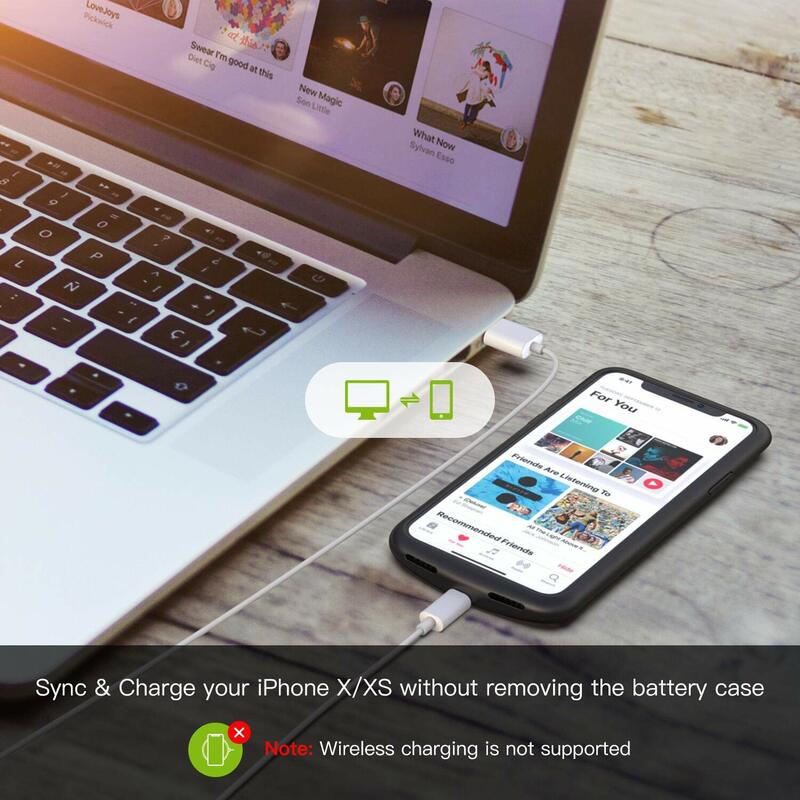 Sync and charge with original charging cable.
. 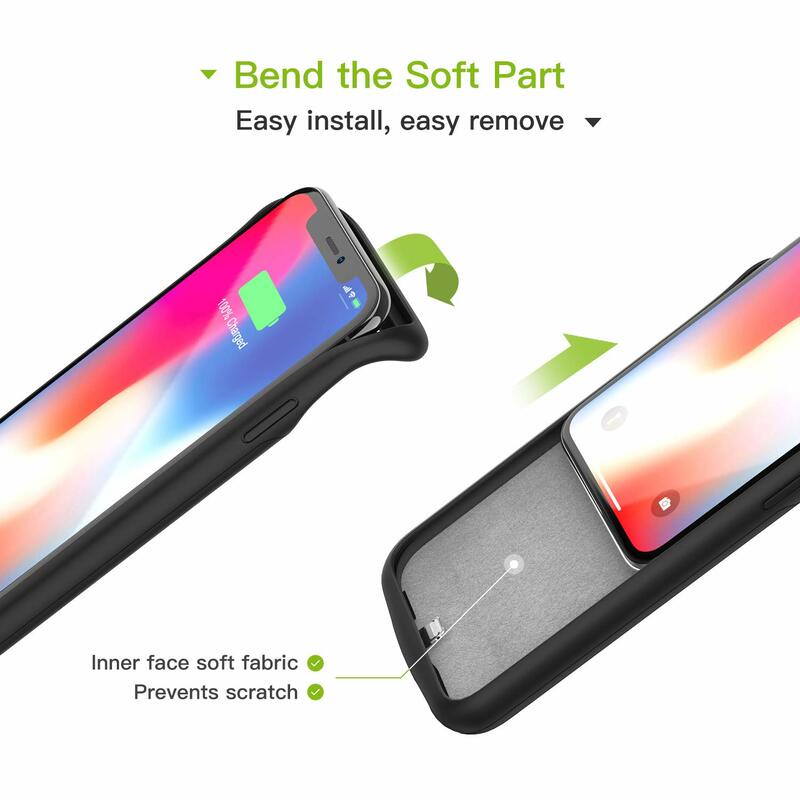 Attached the fabric of the battery case forms a protective layer that resist scratches. No “chin” design, perfectly fits the original headphone without audio jack extender. Featuring with four LED battery level indicator will imply you how much juice is left. 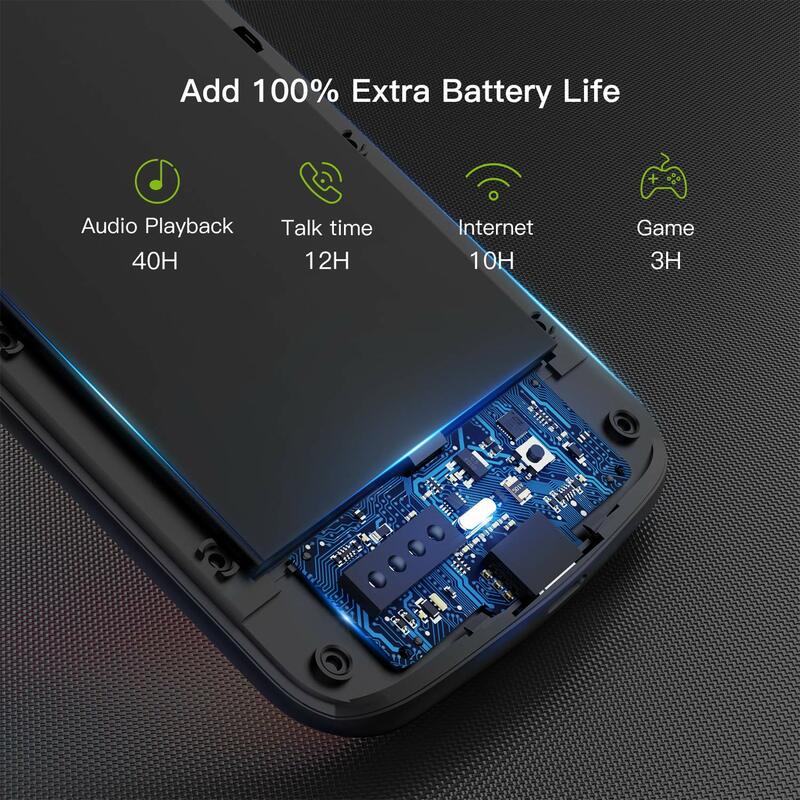 4000mAh built-in battery provides your iPhone X 40 hours audio playback,12 hours talk time,10 hours Internet use and 3 hours game. Wireless charging is NOT supported. Please bend the soft top part, then push your iPhone X / 10 out. Please don’t put this battery case in damp environment use or near the heat source. This battery case is not automatic,it is manual activated, please press the power button on the back for 3 seconds to start charging. 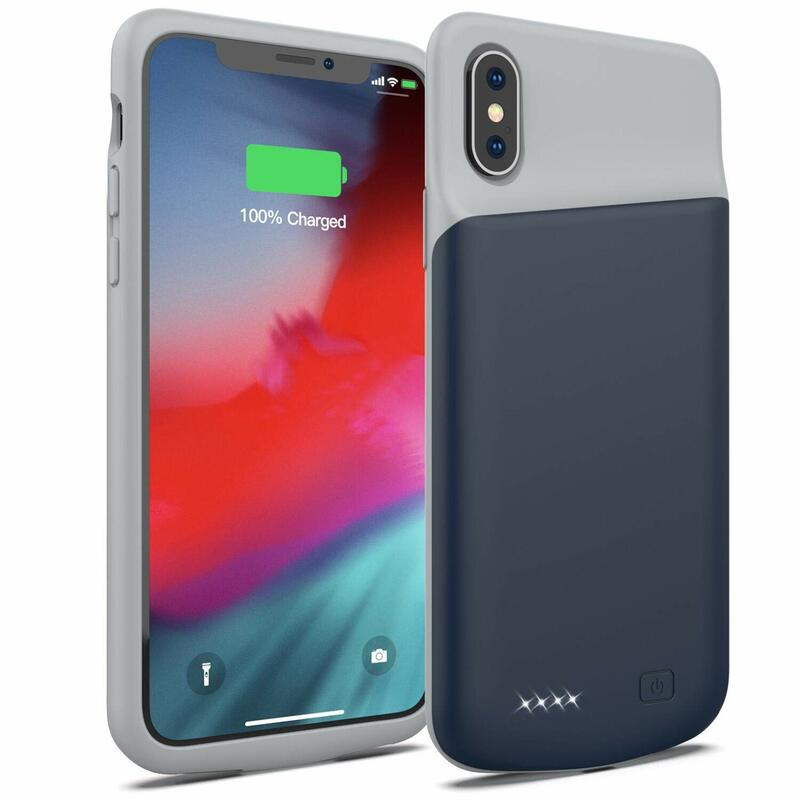 iPhone X / 10 battery case does Not Support Car Charger, high Voltage or Quick Charge deployed adapters, please use original charging cable and wall adapter (5V/1A ONLY) to charge the battery case. 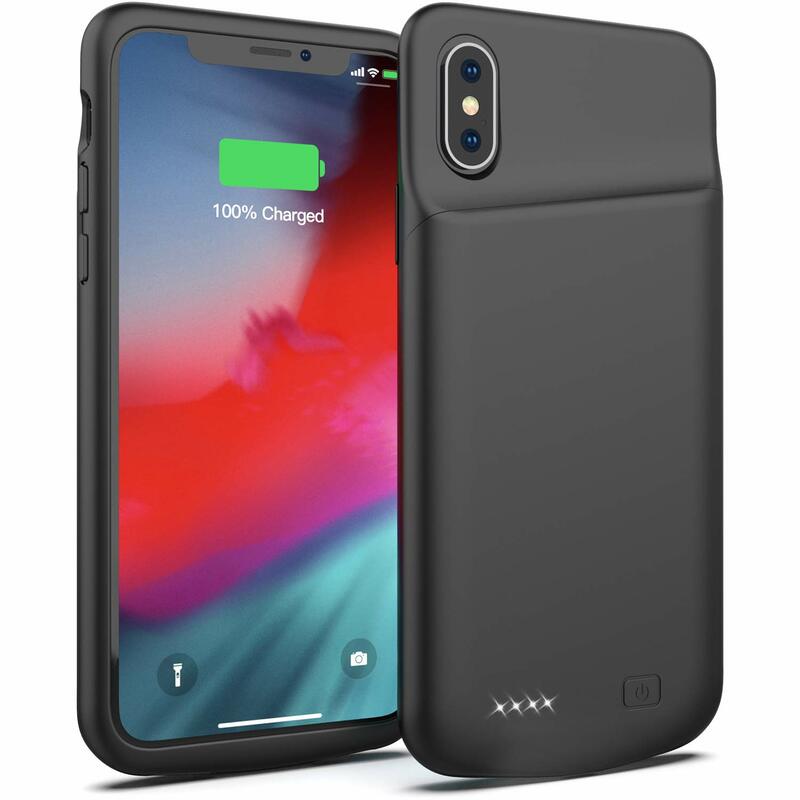 Seeing as I tend to forget to charge my phone throughout the day this case is perfect as I only need to charge once and I have the backup battery for the remainder of the day. 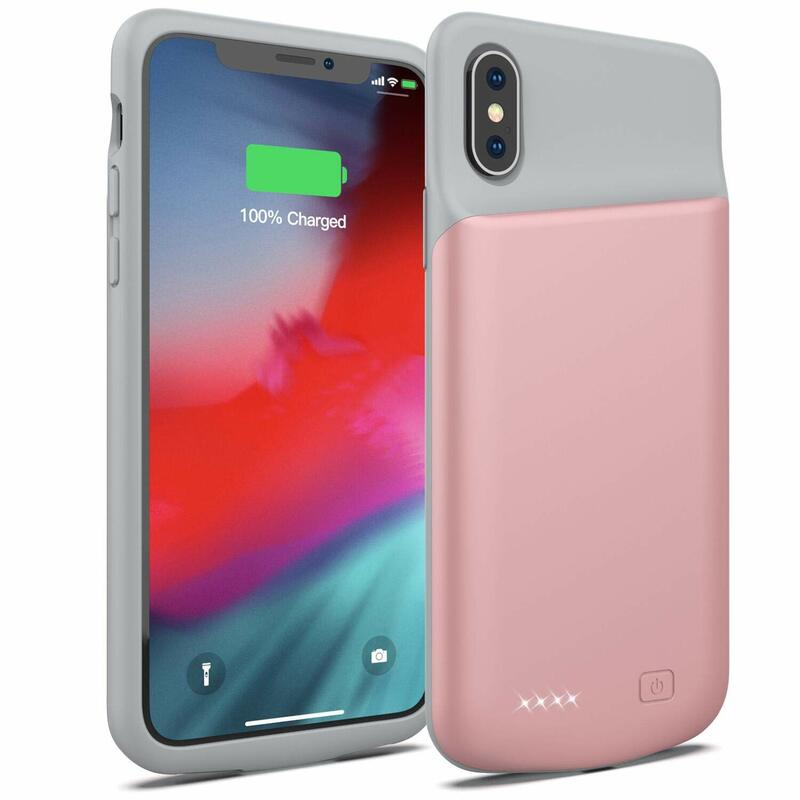 The great thing is that it takes the iPhone's lightening cable as its charger and charges your case and phone at the same time, so no need to buy additional cables like a micro-USB most cases come with. Sturdy and all rubberized so it provides a good grip and peace of mind should it fall. This is a great upgrade from the previous model. The problem with the charger port is fixed. Now my charger can fit snug and does not fall out. I love the sleek design and grip of the material. It does add a little bit of bulk but overall is fine. 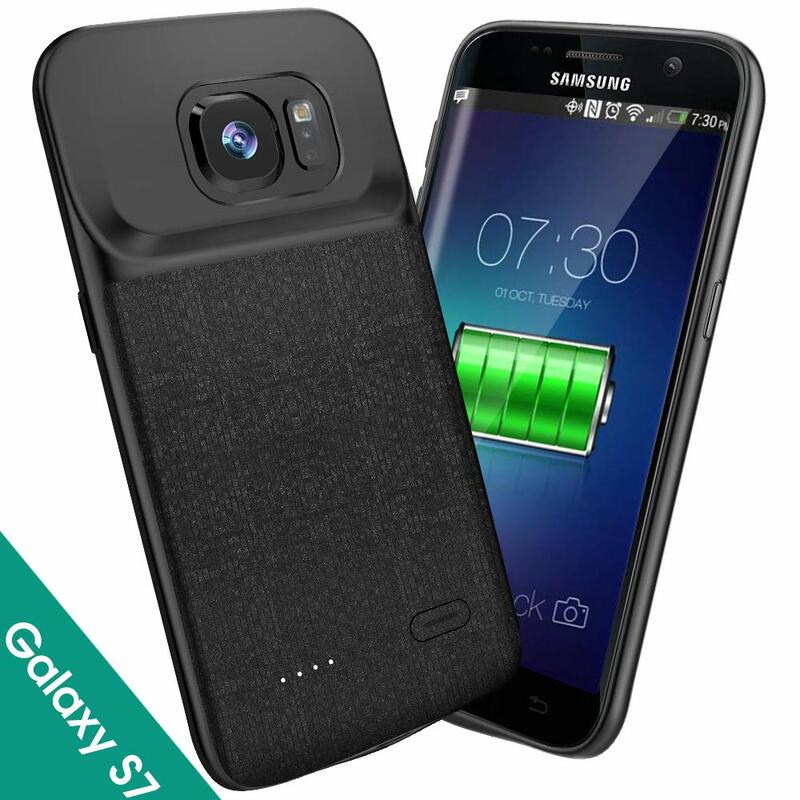 The battery pack charges very quickly which is nice and charges both the phone and case at the same time. I absolutely love this model of rechargeable case. I hope that in the future they add a magnetic back so it will be compatible with magnetic car docks. would hinder the usability of the battery case. allow me to use it simultaneously. Best fitting and feeling battery case I ha e found so far!! Fits perfectly to my iPhone X and isn’t that hard shell plastic like a lot of them it’s a softer rubber feel. Doesn’t slip out of the hand very easy. I love it!!! 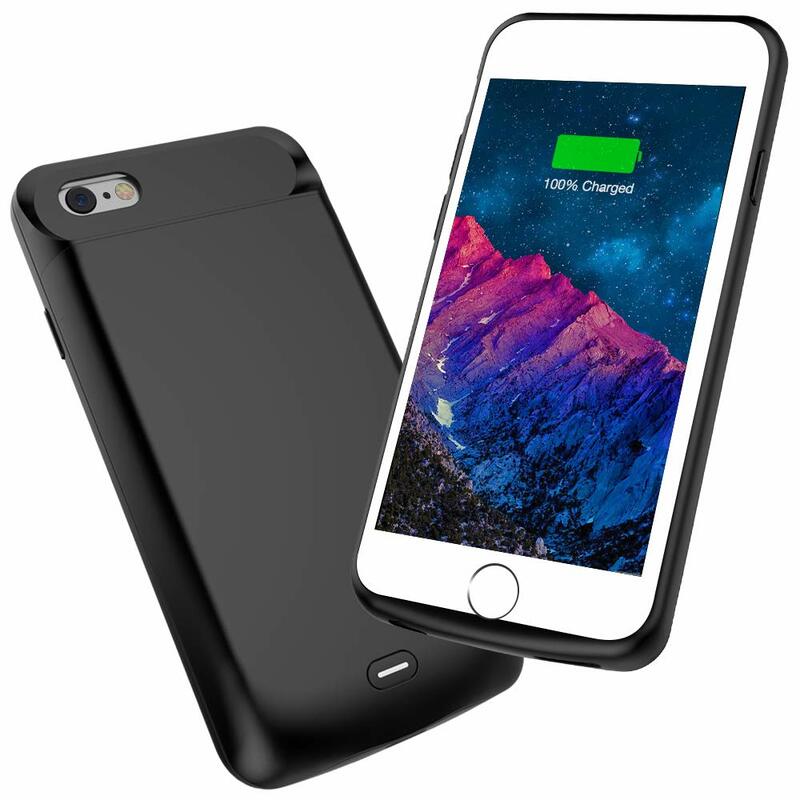 I’ll start off by saying that I have tried a lot of similarly priced battery cases, but this is by far the best. Not too heavy or bulky. Not super brittle like a lot of them. It’s a single piece, rather than the kind with the cap on the top. I definitely like the fabric on the inside of it as well. 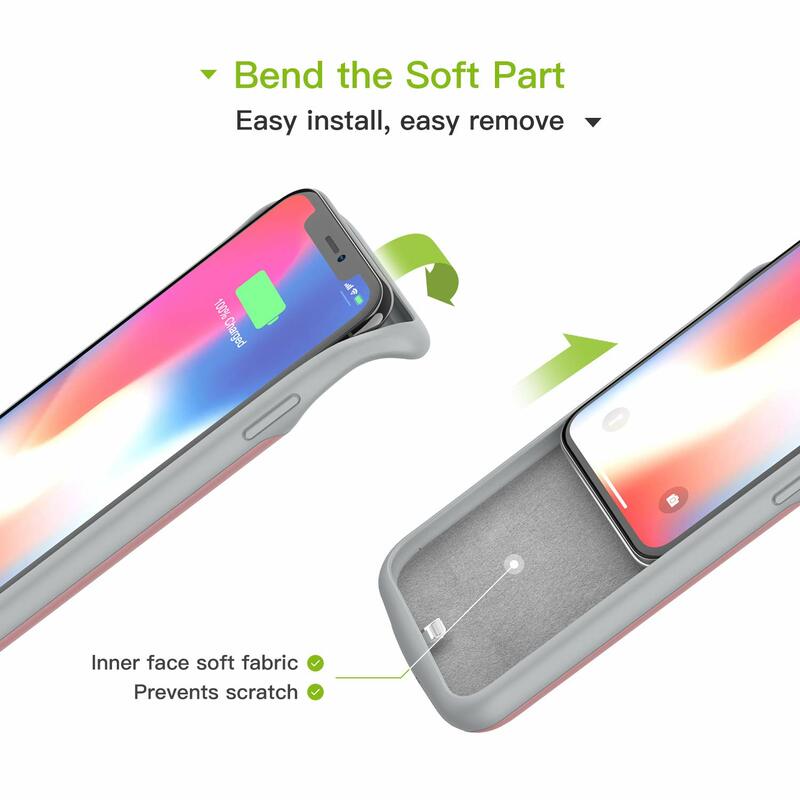 It seems to save the body of the phone from scratching inside the case. I get a little more than a full charge from zero with it, and it’s nice to have the pass through lightning charging as well. There’s also quite a bit of overlap around the screen to save the front as well. I did have to change my screen protector to the kind that just covered the front, rather than the one I did have on, which was a curved one that wrapped onto the bezel. Bottom line: This is a great case at this price point. I’m pretty happy with my purchase. The product itself works great. It is simply much heavier and larger than I hoped it would be. I did upgrade from a iphone 6S to the X -- a larger phone overall but I really preferred my previous smiphee slim case that was available on the 6S. 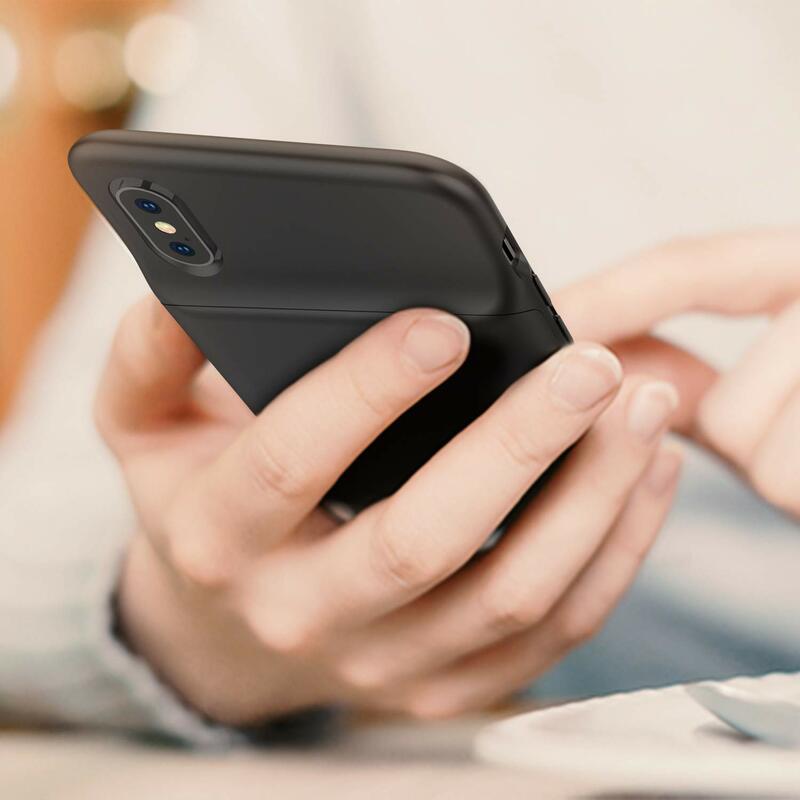 While very durable, easy to use , convenient with apple charge port, and easy operate buttons, the phone case is heavy and adds a lot of thickness to the phone. The case adds 1.5 charges to my phone life which is amazing and it does slide in and out of my back pocket easily. I will not return it because I absolutely need the additional battery life and protection. Simply wish it was a little slimmer and lighter in weight.